With all my training, I rely on my Garmin Forerunner to record my distance, time and pace (speed). 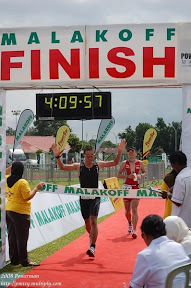 My first Garmin is Forerunner 301 which I bought in Dec 2005 from GL Extra, Kiulap. Six months later, I bought Forerunner 305 from online store in UK. 305 is an upgrade version of 301 which is more reliable with improved reception near trees and building due to its high-sensitivity GPS receiver. Unfortunately, the 305 was damaged during my Panaga triathlon race in May 2007. Luckily I didn't sell my 301, so now I'm using it back. If you noticed, the 305 display is broken, thus causing water to seeps in and damaged the components. 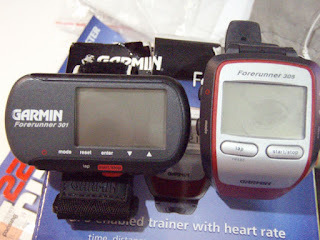 Hopefully, I will buy a new 305 or a new improved model of Garmin Forerunner next year. The 305 has travel to Singapore and Hongkong and has help me a lot. Before using Garmin Forerunner, I was using Nike triax CV10 which has a heart rate monitor and a foot pod for measuring distance, time and speed. The only problem I have with these is that I have to calibrate the foot pod every time I changed the batteries either the watch or the foot pod and the batteries usually dies out very quickly, less than 2 months. I used you post in my review of the 305 here.